Vive le livre! Long live books! 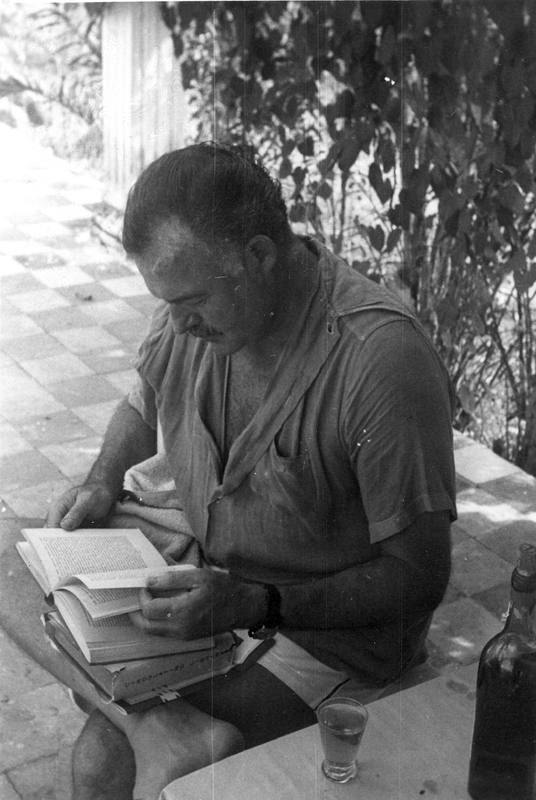 Ernest Hemingway reading outside his home, Finca Vigia, San Francisco de Paula, Cuba. Credit Line: Ernest Hemingway Collection. John F. Kennedy Presidential Library and Museum, Boston. I adore the tactile experience of holding a book. I like gazing at the cover design, feeling the weight of it in my hands, and most of all, the smell of them, both new paperbacks and old leather-bound. It appears that I’m not alone in this odd fetish as there have been a few perfumes created especially to smell like books, such as Geza Schoen’s Paper Passion and CB I Hate Perfume’s In the Library. Most bibliophiles like me have fond memories of the comforting smell of ink and paper. I even like looking at the way books are arranged in libraries, both personal and public, like these photos on my Pinterest board. As much as like all of these things about printed books, I’m not so fond of the backbreaking work of carrying them around with me all day long. I like reading on the subway or any moment when I am alone and can pause, so the iPad comes in very handy. No need to lug that thousand-paged hardcover around–you can have hundreds of books at your fingertips. This article in today’s Mashable.com about e-books and print books explores the pros and cons of both. Called “Why Printed Books Will Never Die,” Josh Catone posits that the two are completely different experiences that can’t be compared, and so the printed book has nothing to fear from the e-reader. How do we keep printed books in circulation? By buying them. Support independent bookstores who do the work of keeping print alive and well. This might sound nuts, but if I buy an e-book that I really enjoy reading, I will always buy the paperback version as well. When the world comes to an end and we have no electricity, I would still be able to read by candlelight and sniff a delightful book. 4 Responses to "Vive le livre! Long live books!" I’m crazy about the books. I’m pretty sure I would be very happy working in some old library. I remember our old library smelling like sweet dust and leather, wood and ultrapas desk with linoleum flor in one room and wood floor in the other room. It was that small. I totally agree with you! I went to school at an old university in New England, and their library has substantial holdings of old books. They are set in stacks that were lit with dim florescent lighting and featured row after row of narrow shelves. Some of the books have probably never been touched in 50 years. I spent a lot of time in those parts of the library, browsing, taking notes, discovering.